Taking care of our teeth is not just a daily responsibility, but rather, a lifetime commitment. Without our teeth functioning properly, we would have a difficult time doing simple tasks like eating, pronouncing words, and even smiling! Even though speech is not usually associated to teeth, there are some sounds that can only be produced when our tongue is in contact with our front teeth. This makes our teeth very valuable for us to effectively communicate. Imagine trying to eat without teeth. Hard, right? Our teeth are important to help us cut and grind our food before swallowing, and our digestive system would feel mighty neglected without our them! Our teeth also help us to maintain our personality by letting us show off our bright smile. Cosmetic dentistry is becoming increasing popular as time passing on. From teeth whitening, invisalign, to having crowns, bridges, and veneers, the technology for cosmetic dentistry is constantly improving. A trusted Cosmetic Dentist has various tools, techniques, and knowledge at their disposal to improve the quality of your smile. Before you decide to undergo any cosmetic procedure, be sure to assess the pros and cons. Also make sure that you’re ready to pay for any required maintenance and whatever take-home maintenance products the dentist prescribes you after the session. Teeth whitening is a procedure that can be done in-office or at home. It usually involves specially formulated whitening gels that are applied to the teeth, and also laser technology in the form of a light that helps activate the gel to whiten teeth effectively. Orthodontic options are usually prescribed to patients having problems with the alignment of their teeth which causes them to have bite problems. With the same results as traditional braces, Invisalign technology allows the patient to enjoy straightening their teeth, without having discomfort caused by traditional braces. Bridges, crowns, and veneers are prescribed to patients that have lost teeth, or who have some other cosmetic dental problems, such as discolored or decayed teeth. These procedures involve the reduction of the natural tooth surface in order to add the replacement piece. Even though the replacements are not real teeth, they can function just the same. A modern approach to replacing the teeth involves the installation of titanium screws on the jaws, thus replacing the lost tooth’s roots. Once stable, the dental implants will be fully functional. Don’t ever feel like you have to live with a smile that you are less than happy with. 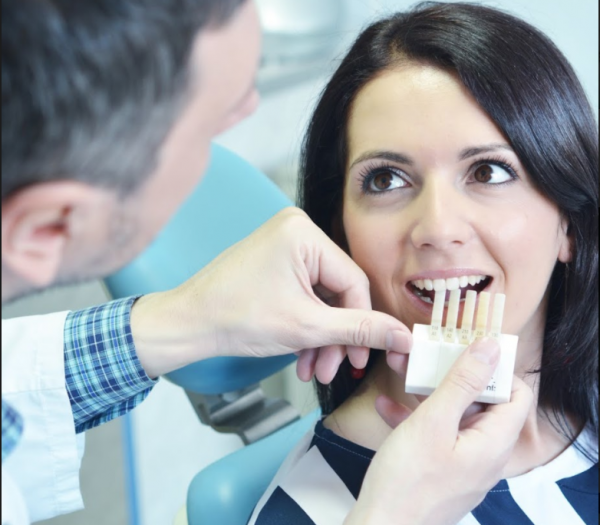 There are many cosmetic dentists available to assist you in improving the appearance of your smile, and you’ll love the confidence you’ll feel that comes from it.